As a follow-up, I've just re-installed 3DNA Windows (x3dna-v2.3.zip) in native Windows environment. 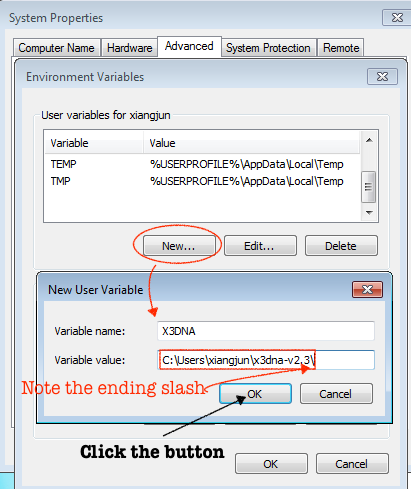 I'm convinced that if you added the end slash in your setting of the X3DNA environment variable, as noted in step 4.4 (with the screenshot linked below), 3DNA would work as expected. Please have a try and report back your findings. I fixed it creating just another folder for config with the name of "x3dna-v2.3config"
Edited: Maybe the .zip you tested is not the same as the uploaded one? And that's why there is something missing? Thanks for reporting back. I'm surprised to see that with ending slash you could (still) have the originally reported problem. With ConEmu, could you please post back the output of the following commands, preferably with a screenshot? I'm glad to see your smart workaround by creating a x3dna-v2.3config folder. The volume of unit C has no label. Thanks --- the output result is as expected. Then 3DNA should work with the original config folder, without creating a new x3dna-v2.3config folder. Yours is the first reported 'weird' case. Let's see if other 3DNA users have a similar problem in the future. I have tried to download the software of 3DNA with versions of both V2.4.0 and v2.3.4, and then extract all the folders from the zip file,but I can't find license.txt file.So, I can't install the software successfully, can you tell me some reasons for this problem? You do not need 'license.txt' to get 3DNA v2.4.0 (or v2.3.4) up and running. What do you mean that you "install the software successfully"? Please provide details, better with screenshots to show the problem you face unambiguously.